On a cruise, of course. Commodore Ronald Warwick, who commanded Cunard Line’s flagships Queen Elizabeth 2 and Queen Mary 2 before retiring last year after 36 years of service to the company, was aboard the Carnival Fascination this past weekend for some R&R. 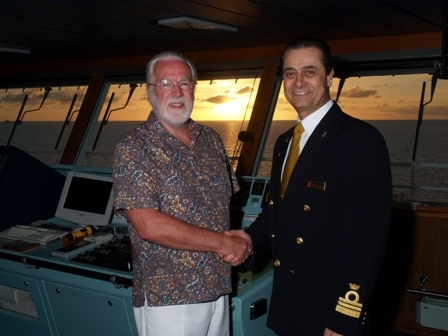 During the three-day Bahamas cruise, Commodore Warwick (left) had an opportunity to visit with Captain Evangelista Salvemini on the bridge of the 2,052-passenger SuperLiner. I certainly hope the Commodore had a great time on FASCINATION and enjoyed his “Fun Ship” experience.. Still, it is difficult to picture him on anything other than a Cunarder.